When I talk about new fiction with customers at the book store where I work, one thing that often comes up is the way that a lot of writers emulate the practice of watching television when they craft their stories. To be more clear; the emphasis is on things that can be seen; the progression of action is cinematic; the action is large and episodic. 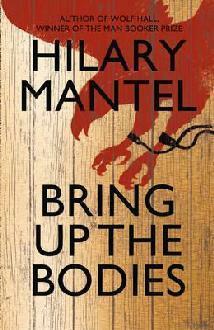 Hilary Mantel's latest novel is brilliant in that it evokes the lavish world of Showcases' The Tudors while at the same time managing to be a complex, character driven literary work. When we left Thomas Cromwell at the end of Wolf Hall, he had successfully removed all impediments to the marriage of Henry the Eighth and Anne Boleyn- only to see before his eyes his master falling for the plain, chaste figure of Jane Seymour at the eponymous homestead. Cromwell is a masterful character. He is made up of the intricacies and minutiae that he deals in; and yet in his private moments of grief he is rendered human. Mantel leaves us with a portrait of an efficient man who does what he must to get by in the reign of a wilful king but remains at heart a man. Other portrayals of Cromwell make him seem like something of a medieval robot, cold and unfeeling in his pursuit of the King's wishes. He is a villain, a shadow-lurker, one who feeds off of the opportunities made by the deaths of other men such as Thomas More and Cardinal Wolsey. But Mantel's Cromwell is aware of his talent for filling dead men's shoes and he is haunted by the voices of his dead contemporaries- he looks to the Cardinal for guidance though Wolsey cannot answer, and the ghost of More mocks him by refusing to stay silent. England may have forgotten these men, but Cromwell cannot. 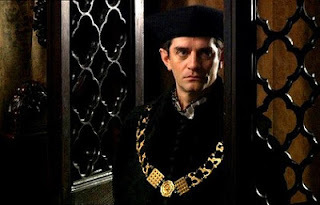 James Frain as Cromwell in The Tudors. To those well versed in modern portrayals of the Tudor period, the novel is both familiar and refreshing. Mantel appears to be constructing a kind of jigsaw puzzle in which canonical facts are present- such as the use of a French swordsman for Anne's beheading, and his distracting cry of "Fetch me the sword"- but other familiar scenes are turned inside out. The so called torture of entertainer Mark Smeaton is portrayed as a kind of psychological game, in which Mark is allowed to believe he will be tortured, and so scares himself into confessing. The rest, such as the use of the rack or a knotted rope to pop his eyeballs, is shown to be the work of the rumour mill which is working overtime throughout the novel. In such ways is the nature of the historical record shown- documents from the period, while fascinating, are also fragmentary and biased. Mantel acknowledges this fact, and the possible implications of her interpretation in her acknowledgements. She calls her novel an offering. As a former student of history, I find this approach commendable. And I find this book delightful. A must read. Five out of five decapitated queens. Sounds like something I would like! I'll add it to my To Read list!